GLENDALE, Calif., Jan. 29, 2018 /PRNewswire/ -- Applebee's Neighborhood Grill + Bar® today announced another incredible deal: every delicious, juicy, piled-high Handcrafted Burger on the menu is now available with a side of fries for only $7.99. For a limited time, guests are invited to enjoy a variety of craveable burger options, including the All-Day Brunch Burger, Whisky Bacon Burger, Quesadilla Burger and more, smash-grilled on a flattop and made to order at their neighborhood burger restaurant. With nine tasty, high-quality burger options to choose from, it's no wonder Applebee's serves more than 20 million burgers each year – and every single one of them is made with smashed, 100 percent fresh, never frozen North American ground beef for a juicier, more flavorful burger that's handcrafted with only premium tasty toppings. "Our burgers are crazy good, and a guest favorite on our menu for sure," said Stephen Bulgarelli, chief culinary officer of Applebee's. "We give our guests a huge variety of burger options to fit the moment –feeling traditional, our Classic Burger is here for you; adventurous, we've got you covered with the Quesadilla Burger; missed breakfast, we put an egg on our All-Day Brunch Burger to satisfy your cravings." Whisky Bacon Burger: Savor the rich flavor in this tasty original. Caramelized onion and bacon seared into an all-beef patty piled with Pepper jack cheese, crispy onions, more bacon and Fireball® Whisky-infused steak sauce on a Brioche bun. Quesadilla Burger: Part burger, part quesadilla, it's wild! This original burger creation comes piled high with Jack cheese, our signature Mexi-ranch sauce, crispy bacon, fresh pico and shredded lettuce in a crisp, warm Cheddar quesadilla. All-Day Brunch Burger: A wake up call for your taste buds, bacon and onions are seared into an all-beef patty topped with crispy hash browns, American cheese, ketchup and a fried egg on a Brioche bun. Enjoy breakfast at lunch or dinner. Caprese Mozzarella Burger: Juicy, all-beef patty with seared-in garlic and onions topped with grilled tomatoes, red onions, fresh Mozzarella, fresh basil and balsamic aioli on a Brioche bun. Classic Burger: A juicy, all-beef burger classic with lettuce, tomato, onion and pickles on a Brioche bun. Classic Cheeseburger: A juicy, all-beef burger classic with lettuce, tomato, onion, pickles and melted cheese on a Brioche bun. Classic Bacon Cheeseburger: A juicy, all-beef burger classic with lettuce, tomato, onion, pickles, melted cheese and bacon on a Brioche bun. The American Standard Burger: Juicy, all-beef patty with seared-in bacon, diced onions and pickles topped with melted American cheese and our signature sauce on a Brioche bun. Triple Bacon Burger: All-beef patty with bacon seared in and topped with Cheddar, tangy BBQ bacon ranch and more crispy bacon slices on a Brioche bun. Anyone can tell the difference between a top-quality burger and an average one, but only if they've tasted the magic that is Applebee's Handcrafted Burgers! And they pair perfectly with one of Applebee's many ice-cold beverages. "Nothing beats a burger and a beer. If you're going with our All-Day Brunch Burger, pair it with a Blue Moon® Belgian White. 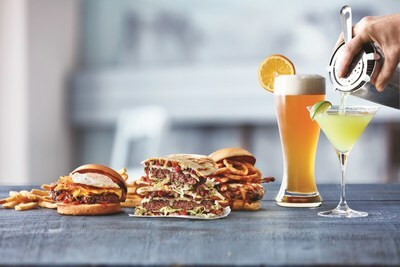 The zesty orange flavors of America's favorite wheat ale brighten any burger that has an egg on top of it," said Patrick Kirk, vice president of beverage innovation at Applebee's. "If you go for a Quesadilla Burger, pair it with Applebee's one-and-only, Perfect Margarita to complement the flavors." As always, Applebee's reminds you to please drink responsibly. 21+ only. For more information on the Handcrafted Burgers menu and other great deals, check out Applebee's online menu and stop by your neighborhood Applebee's. Price and participation may vary by location.